The 2019 ESEE Conference will take place at the CREA center of Acireale, namely Centro di ricerca Olivicoltura, Frutticoltura e Agrumicoltura (OFA). The centre is focused on genetic, breeding, propagation techniques, conservation, selection and constitution of new varieties of typical crops in the Mediterranean area, in particular citrus, olives and cereals. The CREA-OFA research is also focused on cultivation techniques to develop methods for sustainable and economically efficient growing, on quality and healthy fruits and products addressed to fresh consumption and industrial transformation. Another research field is based on the resistance to adverse factors in pre and post-harvest, biological, chemical and integrated fight and in relation to infectious diseases. The center was born in December 23rd, 1866, in the early years after the Italy Unification, when the "Comizio Agrario del Cicondario di Acireale" was recognized as a public utility plant and its headquarters was in the "former Capuchin Convent". For over forty years experiments were conducted at the Institute on several areas, such as: (citrus, fruit, viticulture and enology) and many other crops (wheat, potato, sugarcane, tobacco, etc.) as well as on farms (bug silk, mule and horse, and others). It continued to operate on these functions until July 7th, 1907, when it was founded the "Experimental Station of Fruit and Citrus in Acireale" which, in 1929, as every experimental station, was equated to University Scientific Institutes. 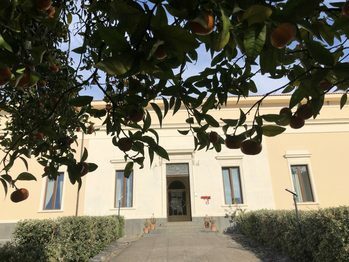 In 1967, following the reform of research Institutes affiliated to the Ministry of Agriculture and Forestry, it was established the Experimental Institute for Citrus cultivation in Acireale. This reform implied substantial changes in the mandate as limited to only the citrus business. In 1999 the center joined the Council for Research and Experimentation in Agriculture (CRA). In 2007, following the rationalization plan of the research facilities of CRA, it was established the Research Center for the Citrus crops and the Mediterranean (CRA-ACM), which brings together different expertises. Currently, the areas of scientific interest of the Centre are mainly citrus, grain cultivation and olivicolture. In 2016 the Center takes the current denomination CREA - OFA. It has six experimental farms. One of these presents one of the most important and comprehensive collections of germplasm of citrus in the Mediterranean basin. The Centre also has a large collection of germplasm of durum and bred wheat, in particular of ancient Sicilian populations and accessions introduced from other countries, but also of minor cereals (barley, oats, etc..). The Center has also a historical Library that contains over 40,000 volumes, over 6,000 of which published between 1585 and 1900 and several laboratories commonly used for various scientific areas, and other research focused on specific sectors: a laboratory of Pomology, a laboratory for in vitro culture, a laboratory of molecular biology, genomics and transcriptomics, a virology laboratory, a laboratory for agricultural chemistry autoanalyzer, a laboratory analysis of juices and essential oils, a fresh cut laboratory and a laboratory of entomology.